58-70 York Road benefits from an existing planning consent for the delivery of a ground floor commercial unit and upper floors consisting of 39 residential units with 9 are designated as shared ownership units. The current proposal is that 29 (1 and 2 bedrooms) of the 82 homes will be Affordable. This is over 35% of the total residential units delivered on the proposed development and it exceeds the Borough target of 33%. In other words: we could fix our level of desired profit to whatever % (let say 20 or 30%) and then demonstrate that it is unfortunate that we cannot reach that level; but as we are really nice folks, we agree to make a bit less profit to provide 2 or 3 more units! If you want to make your own viability study, the previous consent brought the value of the site to £7,250,000 (offers invited in excess of, for a Freehold Residential Development Opportunity with existing planning permission) for 0.25 Acres (0.1 Hectares). The proposal attracted 16 objections so far. 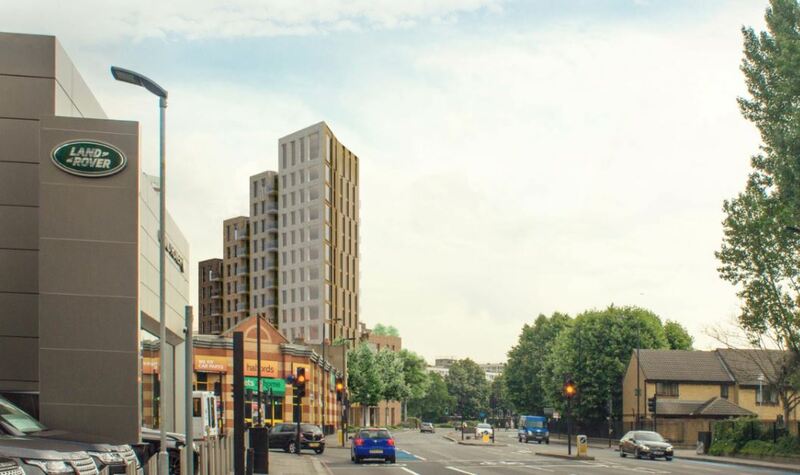 As usual in this location predominantly low rise until recent change forced by the Council’s decisions, comments criticise the misleading pictures on the publicity material, as the towers dwarf the existing low rise buildings either side of it. It will be twice the height of the nearest building, Badric Court and will block the light and view for many existing residents (the developers are claiming that those are all bedroom windows so it does not matter; they assume you only sleep their probably). The 7 car spaces provided makes a mockery of the intention of the developers nowadays to provide no-car-allowed buildings while everyone knows that the public transport system is already congested. Badric Court residents are already competing with others to find a parking space and often need to parks elsewhere. ; this will just exacerbate the situation. In two years, the Council has considered, recommended or approved hundreds of new units for this compact location, transforming an area that was said to be inappropriate to buildings of 9 storeys or more (according to the Council’s own Policy) to a place that could rival with Vauxall, where the standard becomes a 20 storey tower that could very well be erected in Canary Wharf. TOTAL so far = around 1500 units (therefore likely to represent 4000-5000 new residents). The only major transport improvement currently being considered is Crossrail 2, likely not to happen for the next 15 to 20 years, and still under discussion for funding. Maybe the current Council does not worry as they forecast that a large part of these new dwellings will be bought by foreign investors, not planning to use them or for a short period of time each year? Or maybe the current Tory cabinet is planning not to be in charge in future years, in order to be able to blame whoever is there in future for the chaos they created? Cyril I find your bulletins very informative but wonder if you are ever pro any development or is it political as you seem to have an issue with the Tory Council? I have no issues with Tories although I wouldn’t position myself as a Conservative. The truth is for certain things I will probably find myself against the Labour Council of Lambeth and Southwark if I was living there, and will voice my concerns as vehemently if they dismiss them (you will find articles on CJAG.org if you search for Lambeth and Southwark). My only interest is to voice the concerns of the residents, people actually living there and who are just sidelined by arrogant politicians who think that they now better and have the right to patronise and ignore local concerns because they have been in place for decades and think they always will be. Last but not least I believe in transparency (thus as you ask me a direct question I hope you believe I make a honest response here), hate meetings behind closed doors, and think people should stand for what they believe and not go with the flow of cynicism. It seems that nothing is changing and it is really upsetting. Cyril I appreciate your honesty but one of the reasons we have a housing shortage is that the consultation process is open to abuse by public and political agenda. In the 80’s the LDDC in docklands regenerated the Docklands as it short circuited the prolonged planning process… tall buildings little affordable housing and if you go down there it looks great? Take the politics out of planning and then you have a solution? First the housing shortage may be disputed. Just by Googling, you will find many studies showing that only a third of all new build is dedicated to people living in it, the rest preempted by rich investors. a) Letting the “market” decide, in the hope (without certainty) that amongst many “luxury” flats some money will go to less valuable (for developers) affordable/social housing. This is the view taken by Wandsworth Planning officers as they acknowledged to me in the past. b) Facts showing that the market doesn’t regulate itself “by magic”, rules and regulation must be imposed (and the bigger the crisis, the tougher the rule) either by enforcing high level of affordable/social housing amongst new build (even if there is impact on the profit made by private developers), or by the local authority and central government acting as the developer to promote housing for people who “really” need it. Obviously you would have guessed what is my way. In other words, if you want 10 affordable flats out of 30 units, you enforce 33%, while Wandsworth Council is saying to the developers: I grant you 100, so you can provide 10 – that is why they build so dense and tall. I get your point about the rich investors but that’s a global problem in desirable locations. Interestingly I’ve lived and worked through two recessions and no one ever comments on the housing shortage in a downturn, nor did the Registered Providers capitalise on land buying opportunities. How many “social’ units are the RP’s building, most like L&Q, Notting Hill, Genesis etc are more interested in being private developers than sticking to their original ethic of building “affordable” housing. Free market forces dictate land prices and artificially engineering that by imposing affordable housing incentivises developers to find loopholes. Tall buildings by default throw up real issues as far as affordable housing- single cores, high service charges etc that are a fact not an excuse. If we don’t go up, we go out and erode the greenbelt. I wrote to the Mayors Housing Minister James Murray and asked what was being done to police the existing stock to make sure applicants and tenants were bona fide, so social housing stock was freed up when people no longer qualify. His reply is there is no income cap on affordable rent housing, so you can be on hundreds and thousands a year and if you once qualfied remain in the housing. That along with fraud and subletting is another major contributing factor. According to LB Wandsworth 0.02% percent of the housing stock in borough was the subject of fraudulent claim prosecutions. We need to find another way of providing affordable housing rather than making it a land tax which on-site effectively is?